McConaghy & Schionning Designs have been commissioned to design and build an exciting new 49′ performance catamaran. 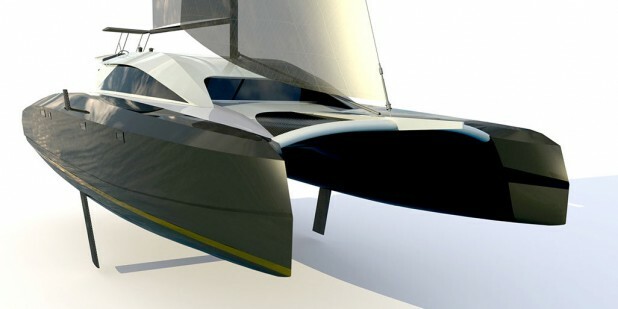 The vessel construction is based on McConaghy’s experience in lightweight high quality build techniques and Schionnings expertise in high performance cruising catamaran design. The S49 will offer similar internal comfort and space to the production boat competition, but boasts a high quality McConaghy standard custom yacht finish as well as being far lighter, stiffer and stronger with better waterline beam values and higher power to weight ratio. Designed primarily as an efficient fast sailing cat with high bridgdeck clearance and chamfer panels to minimize slamming. Weight is centralised to reduce pitching and build weight is around 30% lighter than most of the competition. Twin daggerboards improve windward performance. The vessel is constructed using the best quality materials: Corecell foam and Vinylester resin, build speed is achieved using Schionnings very well proven combination of “soft” sections . The boats are built to a very high standard in China at Mcconaghy Boats which is a totally foreign owned facility under strict quality control by their team of expat builders and high skilled Chinese staff which allows for competitive pricing compared to other catamarans of this caliber. The S49 will be very easy to sail using electric winches at the raised helm station, with all lines running back to the helm position it makes her an ideal single or shorthanded cat. Single line reefing and furling headsails operated from a static control station makes handling a breeze. Wide side decks and flat foredeck ensures that it is very safe going forward in rough conditions. The design incorporates large deck lockers for storage and a huge cockpit with a very open comfortable feel. This is made possible with the advanced engineering of the boxed bridgdeck not needing a back beam and moving the main sheet track up onto the cabin top which is visible and controlled from the helm station. The helm offers a comfortable two seater position with head and shoulders above the cabin top for perfect all around visibility with all lines close at hand, the fold down shade-top gives the best of both worlds, full shade with the option of zip in clears or sunny side up. Large rope boxes ensure that the lines are kept out of the way and the helm area safe. Inside she has the comfort and luxury one expects from a top of the line cat. The uncluttered saloon and galley are far bigger than normal because advanced engineering allows the mast to be in the ideal position without the normal cross bulkhead restricting the saloon size. There is a gourmet galley, plenty of fridge and freezer space and saloon seating with a big table for indoor entertaining and the luxury of a forward facing nav station with full 360 degree visibility. The saloon front has opening hatches giving good visibility forward and fantastic airflow into the saloon which is a real luxury when anchored in those hot tropical islands. Down below she has the master suite to starboard with a huge almost king size bunk aft, plenty of locker space, a his and hers vanity area, large head with washing machine and separate shower cubicle forward with big hanging locker. There are opening ports, hatches in the deck above and a hatch aft of the bunk give a cool open feel below. In the port hull we have two guest cabins both with big comfortable queen plus bunks, amidships a spacious head and shower area. Each cabin has a private en suite head with further access to the shared shower area, simply lock the door for complete privacy. A nice touch offering bigger head areas while optimizing use of space for the shower which is the least used space on the boat. On the power side she has an efficient alloy mast and boom fully battened square head main, single line main reefing in the boom, roller reefing headsail and furled screecher on the prodder. A spinnaker can be added, flown off the prodder end. A simple, fast, efficient rig. Engine power comes from two Yanmar 50 HP sail-drives with folding props set in separate engine bays with deck hatches for easy access, she has a 6KW genset to power all the equipment and air conditioning. There are large water and fuel tanks to ensure that the vessel is fully self-sufficient while away from the dock. This is a serious blue water cruiser capable of taking you around the world with high mileage daily runs in comfort and safety with minimal slamming.